Of the hundreds and hundreds of tarot decks available today, one deck stands out as the most popular tarot cards of all. The Rider Waite Tarot Deck earns top place among the most popular tarot decks of all time. The Rider Waite Tarot has been known by many names and sold in many versions since its creation more than a century ago. 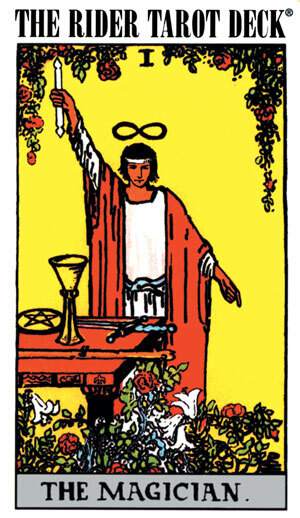 Until the early 20th, the most popular tarot decks were almost all versions of the Marseilles style tarot. These tarot cards were based on the "original" tarot and were named after the French city best known for manufacturing the popular cards. Marseilles decks had a limitation; none of the "pip" cards � the aces through tens � were fully illustrated. They all are decorated simply with the appropriate symbol of the suit and its number. 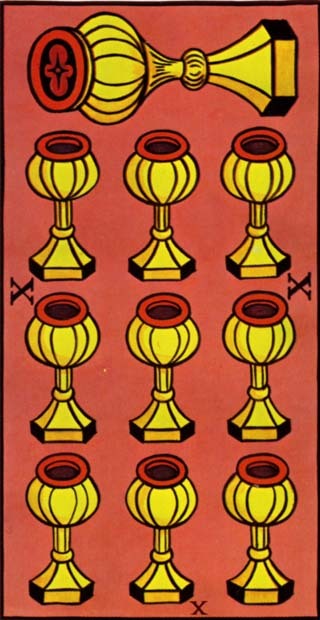 For example, the 3 of Swords card simply shows a sword and the Roman numeral III while the 10 of Cups card simply shows ten cups (see examples below). 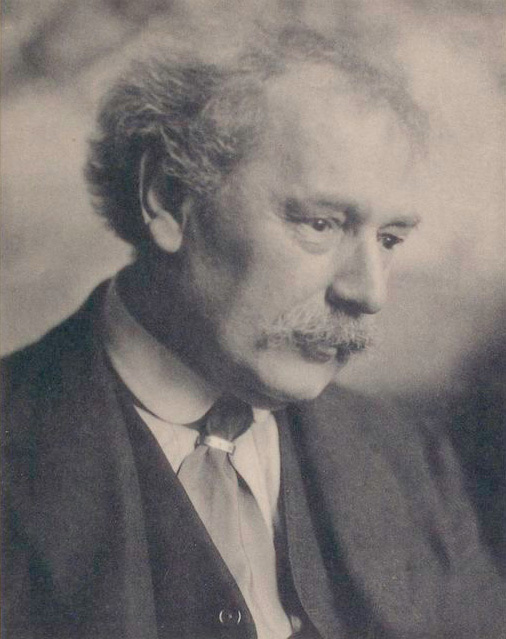 Arthur Edward Waite understood the rich symbolism and spiritual significance that is found in tarot. Frustrated with the limitations he saw in his Marseilles decks, he thought he could design a better tarot deck. In the first decade of the 1900's, he commissioned a friend and fellow Golden Dawn member, Pamela Colman Smith, to illustrate a new deck of tarot cards. Pixie, as she was known to friends, was a young and talented artist and a well-known illustrator for designing ads and theater bills. What Waite and Smith created was unlike any deck of tarot cards that had come before. In the Rider Waite Tarot each pip card is fully illustrated, giving all 78 cards a unique feel that is fully expressive of that individual card's story. Some pip cards are abstract works of art while others are full tableaus of people in action. Shown below are card from a Marseilles Tarot deck compared to cards from the Rider Tarot deck. It's easy to see why the Rider Waite Tarot steadily rose to be the most popular tarot deck in existence. Waite also made a slight change in the order of the Major Arcana cards. 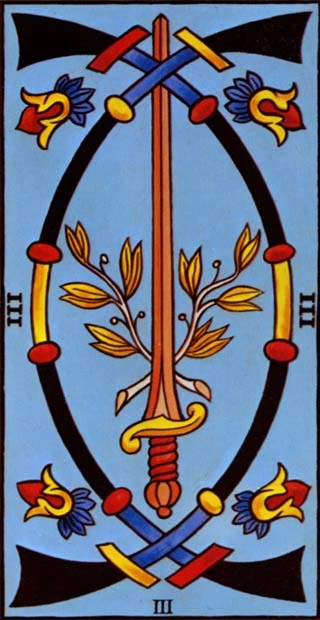 In Marseille tarot decks the Major Arcana card Justice is number VIII (8) and the Strength card is number XI (11). Waite reversed these so Strength is VIII and Justice is XI. 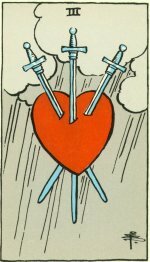 He also removed much of the overt Christian imagery originally found in the Marseilles Tarot. He renamed a few Major Arcana cards to be more inclusive of other traditions � Pope the Papesse became the Hierophant and High Priestess, respectively. He and Smith also incorporated imagery from many non-Christian sources, primarily that of Classical Greece and Rome. These tweaks resulted in a modern, reinvigorated tarot in which every single card drips with symbolic meaning. The result? A rich, dynamic tarot experience that was destined to become more popular than any tarot deck that had come before. The tarot deck Waite and Smith created together is officially named The Rider Tarot � Rider being the name of the original publishers who first produced this deck in 1912. Since then The Rider Tarot has been known by many names. The Rider Tarot quickly became the Rider Waite Tarot, as tribute to its creator, or sometimes just Waite deck. In recent years there has been a push to give more credit to the artist, Pamela Colman Smith, and rightly so. This has led to many calling it the Rider-Waite-Smith Tarot, the Waite-Smith Tarot, or even Waite-Colman Tarot. It's such a popular tarot deck and is so frequently referenced that tarot enthusiasts often use the abbreviations "RW" or "RWS" to save time. Whatever you call it, the Rider-Waite Tarot is everywhere. Pretty much any combination of the words "Rider," "Waite," "Smith," or "Colman," are fair game. The Rider Waite Tarot is so popular it has been the basis for many (if not most) other tarot decks. 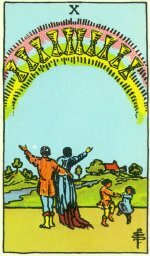 While there are still quite a few decks that use the ordering of the Marseilles decks, or create their own systems entirely, most tarot decks are based on the RWS Tarot. The Rider Waite Tarot is so popular that it has been the basis for many (if not most) other tarot decks. With there are still quite a few tarot decks that use the ordering of the Marseilles decks, or create their own systems entirely, most tarot decks are based on the RWS Tarot. The Rider-Waite-Smith Tarot is so popular it has become synonymous with "tarot." When you say the word "tarot" it's probably on of Smith's illustrations that pops into your mind's eye. Even people who know nothing about tarot recognize Pixie's artwork and know that it's a tarot card. The Magician, Death, the Hermit, and many more Rider-Waite cards have appeared in movies and television, in art and at concerts for decades. Tarot has touched every aspect of pop culture and art form and the Rider-Waite-Smith Tarot is the most popular choice. In short, the Rider-Waite-Smith Tarot has been the most popular tarot deck for about a century,* and will likely continue to be. Tarot itself is experiencing a Renaissance. Longtime tarot deck publishers like U.S. Games and Llewellyn have been gifting us with more and more decks each year. And it's never been easier to self-publish an independent decks, so there are many hundreds of decks out there from which to choose and more being born every day! And yet, it's difficult to imagine a day when the Rider-Waite Tarot is knocked out of first place as the most popular tarot deck. It's ingrained in our culture's collective psyche. Most tarot books and websites assume you use the RW, or are at least familiar with it. It's the "default" tarot deck because it's been the most popular deck of tarot cards for so long. *During the German Blitz of London in World War II, the original printing plates for The Rider Tarot were destroyed. The tarot deck remained out of publication until U. S. Games purchased the rights and began reprinting them in 1971. So, for about 30 years between 1910 and today the Rider-Waite Tarot was out of print.